Cynthia Marie – Philadelphia-based, soon to be Wisconsin-based. Philly Sketchfest – We’re very excited for your National Sketch Writing Month anthology but sad it’s your final show here. How long have you been performing sketch in Philadelphia? Cynthia Marie – I’ve been writing and performing sketch for about 3 years now but for different one-off shows or groups over the course of that time. I also started my own groups, Free Candy with Peter Rambo and Cheat Code with Quinton Alexander, Matt Aukamp, Katelyn Catinella, Peter Rambo, Pat Reber, and Libby Reindall. Philly Sketchfest – Yeah, you’ve really been a part of so many different comedy projects in Philadelphia, sketch or otherwise. Sorry, that’s not really a question. Cynthia Marie – I try to keep busy! I perform improv with Hulafish and No Ghosts?. Last year I got to sing in a Christmas Puppet show at Figment theater. That was amazing. I also love running lights and sound for theaters throughout the city. Production is my love. Each show starts as a tiny kernel of an idea in someone’s brain. Taking other people’s ideas and helping them become a reality is my favorite thing to do. Sometimes it includes building interesting light-scapes or sound effects, or helping someone to film a sketch or web series. I’m also the prop-master at Philly Improv Theater. Sometimes I sew costumes or build props, and last month I made nine puppets for Hey, We’re Cool when they hosted this year’s Black Friday Comedy Marathon. I love anything that gives me the opportunity to be creative in a way that is new or different. Philly Sketchfest – Who or what do you consider your comedic influences? Cynthia Marie – I absolutely idolize Mindy Kaling. I’m always trying to fight my anxieties. Kaling’s works are wholly personal and hilarious. Terry Pratchett is my favorite novelist. He wove social and political satire into all of his works, he was prolific. Edgar Wright and Simon Pegg write movies that are homages to all of my favorite nerdy interests and are brilliantly crafted in their own right. Even Wright’s earliest directorial efforts showed a super human attention to detail. Philly Sketchfest – Let’s go back to the first group you put together, Cheat Code. Tell us about that group and getting into New York Sketchfest 2014 at The PIT. Cynthia Marie – Cheat Code was my first sketch group. I love video games, and I wanted to find a way to write a show that celebrated and mocked the games I love. It was so much fun, and a lot of hard work. Quinton, Katelyn, Matt and Pat were all amazing writers and so fun to work with. I absolutely couldn’t have done any of it without my sketch writing partner and favorite person in the whole world, Peter Rambo. 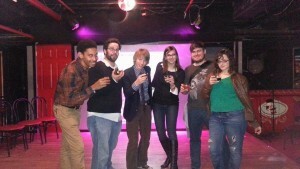 I was thrilled when we got into New York Sketchfest. There were so many talented performers and great shows. I went to some interesting panels. But by far my favorite thing was the SketchCram. On Saturday, writers and performers from all over the country got together to write an entire show. They started at 7 am, and the show was that night. It was a feat I didn’t think could be pulled off, and the show was so impressive. Philly Sketchfest – This year, you participated in National Sketch Writing Month. What was it like to commit and follow through on the process of writing a new sketch every day for 30 days? Cynthia Marie – I actually wrote all my sketches in November! (Editor’s Note – National Sketch Writing Month is September). I vaguely knew about National Sketch Writing Month in September, but the timing wasn’t right then. I regretted not doing it. So when the first of November came, and all my friends were participating in National Novel Writing Month, I just decided to do this instead. I have a lot of sketch ideas that I put off writing because I’m self-conscious. But when you have to write something every single day you can’t hesitate. You just do it. My favorite author, Brandon Sanderson, said that “Sometimes writer’s block is just I’m in a funk that day and my writing just isn’t working. In that case I write anyway and throw it away. Writer’s block is just ‘I can’t write because what I’m writing is crap. '” Even though I’m writing sketches and not SciFi/ Fantasy novels, he was so right. Philly Sketchfest – What’s the ratio of what made it into the show versus what was left out? Any deleted scenes you care to share? Anything in particular you found hard to lose but was cut from the show? 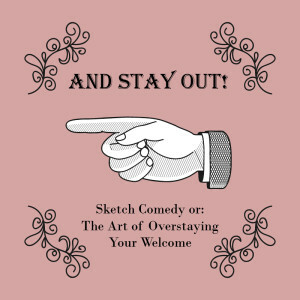 Cynthia Marie – Out of the 30 sketches, I ended up using 6 of them for ‘And Stay Out’. I used a few last month for Black Friday Comedy Marathon as well. There were a few sketches that had sequels that I had to leave out. I originally had a runner of sketches featuring a Buster Keaton-esque mugger. I liked them, but there were other sketches I really wanted to get in as well! It was so hard to choose. I also wrote a bunch of things I really loved that would work better if filmed. Philly Sketchfest – How are you feeling about the show in that it’s your final show in Philadelphia? Is it bittersweet or are you at the point where you’ll be relieved when it’s over? Cynthia Marie – Bittersweet for sure. The performers in the show are so lovely, and it’s wonderful to write, direct, and perform in something that is wholly my own. I love it here, but I have so much to look forward to. I’ll be near family and I’m going to take comedy classes in Chicago. And this isn’t going to be my last show ever! Just my last show in Philadelphia. 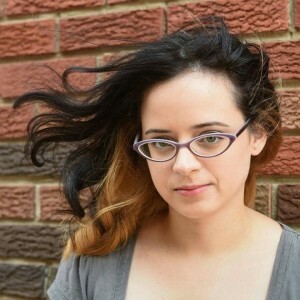 Philly Sketchfest – Cynthia, you will be missed but we’re excited and happy for you. Please keep us in the loop on everything you’ll be doing in Wisconsin and Chicago. Before you go, tell us what’s on your Philadelphia to do list before you leave? Cynthia Marie – Pack! I’m attempting to throw out most of my belongings to live a more uncluttered life. I borrowed a friend’s de-cluttering book so now I have one more item than I had last week, which is the opposite of what I wanted. Oh well! Seriously, I’ve lived in the Philadelphia area for my entire life, so there isn’t anywhere that I haven’t been at this point. I’m usually really terrible at goodbyes, but there are so many amazing people that I’ve met since moving to the city. I just want to spend my last few weeks spending time with all my friends and doing all my favorite things for the last time!. 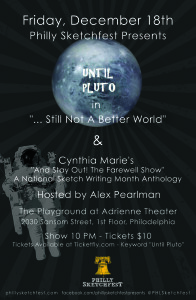 You can see Cynthia Marie and her brand new show, ‘And Stay Out!’ with Until Pluto and Alex Pearlman, this Friday night, December 18th at The Playground of the Adrienne Theater at 10:00pm Tickets are $10 and available online via TicketFly, Keyword – Until Pluto.